A sunspot can be defined as a dark and irregularly shape on the surface of the Sun. The temperature of these spots is usually lower than the surrounding photosphere. The photosphere has a temperature of 5,800 degrees, Kelvin and Sunspots have temperatures of about 3,800 degrees Kelvin. They are caused by strong magnetic activity within the Sun. Their diameter can range up to 50,000 kilometers. They have a lighter outer section which is known as the Penumbra. Its middle section is darker, which is known as the umbra. A sunspot is not permanent. It can last from days to weeks to months and can also travel across the solar disk. Sunspots were telescopically observed in 1610 AD for the first time by Thomas Harriott, Johannes and David Fabricus. A typical sunspot cycle lasts for 11 years. After every 11 years, their number increase and then starts reducing. In 1890 while looking at the historical records, E. Maunder noticed that the number fell drastically between 1645 and 1715. This specific period has been named after E. Maunder. It is known as the Maunder Minimum. 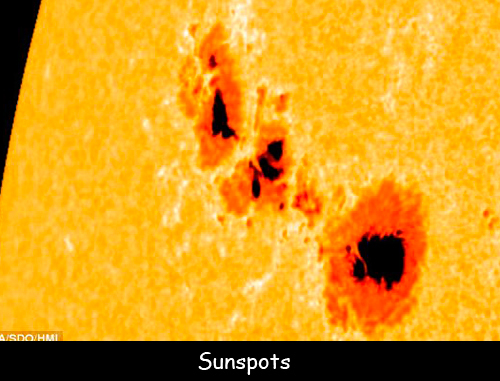 When two more sunspots are gathered in a region, it is known as a sunspot group or the Active Region. These spots may be several times larger than Earth or very small that telescopic observation is difficult. Declan, Tobin. " Fun Facts for Kids about Sunspot ." Easy Science for Kids, Apr 2019. Web. 25 Apr 2019. < https://easyscienceforkids.com/sunspot-facts/ >.